The mobile payments space gets a lot of attention, especially as it seems that a new startup or financial institution launches “a new way to pay, issue rewards or power transactions from a mobile phone” every second, to borrow Leena’s words. Yet, while this “fustercluck” draws most of the headlines, there’s an equally large opportunity on the slightly-less-crowded side of the “mobile payments” market: Bill pay. Pageonce, the maker of a personal finance service for your mobile device, would seem to be the case-in-point. The company’s flagship product, Pageonce — Money & Bills, is an all-in-one, cross-platform mobile finance and bill pay app that allows users to automatically track cash, bills, credit cards and investments across multiple accounts, while providing bill payment and presentment functionality through its proprietary payment platform. Thanks to its near-8 million users and over 6,000 billers, the startup has seen hockey-stick-caliber growth over the last year, announcing today that bill pay volumes processed through its payment platform have reached $1 million per day. 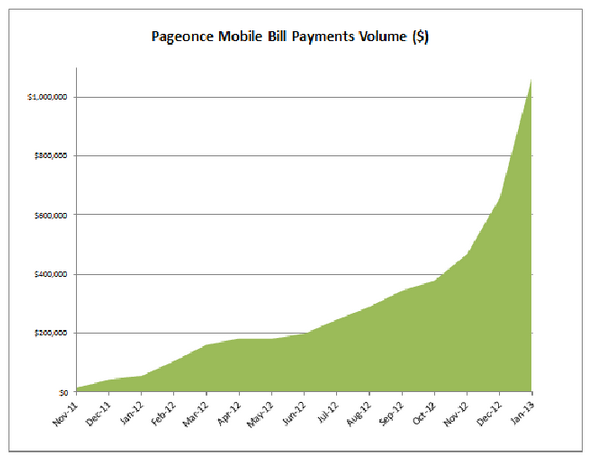 Since introducing mobile bill pay a year ago, Pageonce Marketing VP Daniel Kjellen tells us that the startup is now seeing consistent 30 percent month-over-month growth in payment volume. What’s more, based on this 30 percent m/m growth, Pageonce founder and CEO Guy Goldstein projects that the company’s annual payment volume run-rate will hit $1 billion by mid-2013. The competition, Kjellen says, is primarily focused on offering point solutions, whether it be for budgeting, bill presentment, basic account aggregation or limited bill pay. Pageonce wants to do all of that, while allowing users to take advantage of push notification bill reminders, the ability to pay bills from any checking account, debit or credit card, while offering full bill presentment and free phone support. But, as you can see in the above graph, Pageonce has seen a particularly strong growth over the last three months, which the team ascribes to a new rollout released in November that added a file cabinet and scheduled payments to the app’s functionality. Essentially, this means that customers can now save and instantly view the actual statement from the biller on their phone and access archives for all their bills. 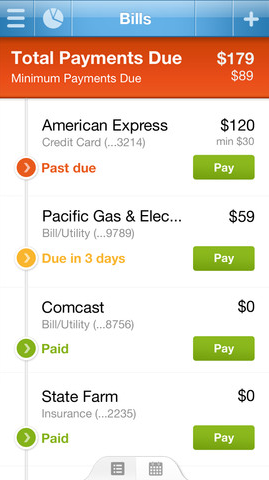 In turn, users can schedule their bill payments ahead of time rather than having to pay them in realtime, allowing them to control when their money leaves their accounts. As to how the startup is making money? Kjellen tells us that the company’s revenue model is two-fold. It charges a per-transaction convenience fee for bill payments using a credit card and, secondly, through “targeted money-saving offers to its users.” Though he would not elaborate on the specifics, he did say that the company has begun to see month-over-month revenue growth increase at the same rate as payment and user growth, which is saying something. Going forward, Pageonce plans to continue going after partnerships like its its recent one with Blackstone Technology Group, which sells technology solutions to utilities that want to add mobile bill payment options for their customers. The partnership allows utilities to integrate Pageonce without the usual IT costs and effort and essentially offers an alternative version of a Pageonce white-labeling solution and providing a valuable customer acquisition strategy. What’s more, with the impressive traction that BillFloat has been able to find by helping customers pay their monthly service bills on time while avoiding late fees and overdraft charges, expedited bill payment services could present an attractive growth opportunity for Pageonce. Not surprisingly, especially given BillFloat’s recent $21 million raise, Kjellen says that expedited payments are on the roadmap for 2013. Now at over 50 employees, Pageonce has raised $23 million to date from Morgenthaler Ventures and Pitango Venture Capital.